Do you know any tennis volunteers, players, or officials who deserve some recognition? How about a coach or tennis pro who would like a delicious dinner, a plaque and her name engraved on a silver bowl? If so, then please nominate these outstanding individuals for the USTA Eastern awards that will be presented at the Section’s annual dinner in January 2011. There are a wide range of awards that will be presented, including the Leslie J. FitzGibbon Tennis Man of the Year, Tennis Woman of the Year, Tennis Family of the Year and Regional Volunteer of the Year. Make sure the great volunteers and leaders you know are represented! - Click here for a list of all awards and their descriptions. - See who won an award last year! - Click here to look back at our award winners since 1998. 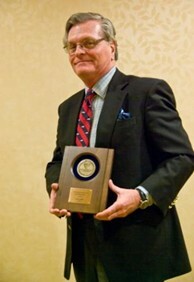 2010 USTA Eastern Annual Conference Awards Dinner. USTA Eastern will provide dinner for the award recipient and one additional guest. USTA Eastern will provide dinner for four members of the Family of the Year recipient.